The mother of a baby who died two days after his birth at the Midland Regional Hospital in Mullingar has said apologies from the HSE are meaningful only if changes are made and lessons are learned. Sandra Cullivan, from Longwood in Co Meath, settled her legal action against the Health Service Executive over the death of baby Stevie, who died on 30 April 2015. Her husband, and Stevie's father, Stephen had died suddenly of a heart attack five months previously. Ms Cullivan said the High Court case was the last thing she had to do to get justice for her son. Stevie Cullivan was born at the Midland Regional Hospital in Mullingar on 28 April 2015. The inquest into his death heard evidence that Ms Cullivan had been left alone in a private room at the hospital for 90 minutes without monitoring before the birth. Ms Cullivan said signs of foetal distress were not identified. 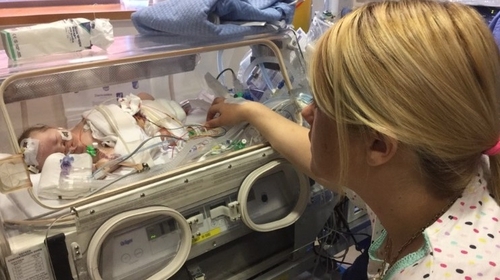 Stevie suffered a lack of oxygen to his brain before delivery and died two days later. The High Court approved a payment of €35,000 to Mrs Cullivan and her daughter for mental distress. The full details of the settlement were not disclosed. Ms Cullivan's husband Stephen died suddenly, five months before baby Stevie's birth. She was vulnerable and her son's birth left her extremely traumatised. She also suffered physical injuries. In a letter to Ms Cullivan, the hospital said it wanted again to express its sincere and deepest sympathies for the sad loss of baby Stevie. The hospital said it wanted to sincerely apologise again for the deficits in care that were identified in a review that took place. Its general manager said she could confirm that the recommendations outlined in the review were fully implemented. Outside court, Ms Cullivan said she was glad they had reached the end of a "long hard road" to get answers. She said she lost her husband at Christmas in 2014 and then five months later, baby Stevie was taken away. She said he would have been three years old now. Ms Cullivan said no words could express her grief but she had got answers with the help of her solicitors Callan Tansey. She encouraged all other women and families to insist on answers and not to be afraid to ask for help to get those answers. Demanding information and speaking were the only ways to bring about change, she said. She said it took an awful long time to get answers and she had to fight really hard. An apology only means something, she said, if changes were made and things need to change. Ms Cullivan said people needed to do their jobs properly and observe the proper protocols so this did not happen to other babies.